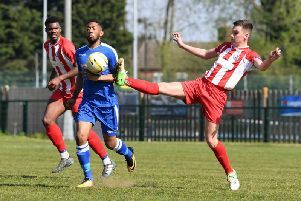 Leighton Town’s misery continued on Saturday as they slumped to their ninth defeat in 10 games with a narrow 2-1 loss away at Hanwell Town. Stuart Murray’s side probably warranted a point for their efforts in West London, but were hampered when keeper Bradley Kirkwood was sent off, forcing defender Jack Copson to play the majority of the game between the sticks. Two injuries within the opening 15 minutes also left Leighton facing an uphill task, with Andy Fagan and Pierre Hazet forced off early. Despite the problems though, Leighton had some decent chances to take the lead. Curtis Shaw went close and Alex Woodfine shot just over when well-placed. Woodfine again went close and an O’Brien free-kick was well saved by home keeper Herdman. The home side, despite their numerical advantage, failed to threaten Copson’s goal though, and both sides went into the break goal-less. Hanwell should have opened the scoring in the opening minute of the second half but the shot came back off the post when the Town defence was opened by a superb through pass. Leighton were playing into a strong wind but were playing well although not any real scoring chances were created. Hanwell had a good spell of possession but Copson was not troubled by any serious shots. Jordan Jenkins was playing well as was O’Brien who had now taken a sweeper type role, but on 70 minutes they were helpless to stop the opening goal. With the ball played into the Town box from the right, Tyler Law’s clever flick set himself perfectly to lob over the hapless Copson to put the home side into the lead. Five minutes later, they were 2-0 up when substitute Dan Vicente double the lead from close range, acting as a real sucker punch for Town. But despite the blow, the 10 men of Leighton carried on fighting to get back into the affair, and forced Herdman into a top stop when O’Brien tested him from range. They got themselves back into it late in the day when a lovely pass forwards from Jenkins picked out Shaw on the right flank. His first time cross was perfectly met at the near post by Alex Wood, who calmly stroked the ball into the bottom corner to reduce the deficit to just one goal. But despite piling forwards in the closing stages, Leighton couldn’t find a breakthrough and had to accept another defeat for the season. Still second from bottom in Evo Stik Division 1 Central, Town are back in action against bottom club North Greenford United on Tuesday night before hosting Aylesbury FC at Bell Close on Saturday.